Castle View studio apartment is in the city' best location with breathtaking views of the Royal Castle, River Danube, Gellert Hills with Citadel and Elizabeth Bridge. These are the part of the World Heritage today. The apartment is situated in the heart of the downtown - Apaczai Csere Janos street - at the beginning of vibrant Danube promenade and within walking distance of most popular tourist attractions. Majority of the big hotels are also located in these area: Marriott, InterContinental, Sofitel, Four Season, Kempinsky. The newly renovated apartment is on the 2nd floor (there is an elevator) and furnished and equipped with brand new pieces. It is new, modern and comfortable. The studio is perfect for couples or singles up to 2 persons. Our apartment is an ideal choice for those who want to explore Budapest on foot. Studio apartment with wardrobes, 2 chairs, dining table, TV set, radio and french balcony. Ventilator. Fully equipped kitchen with fridge, freezer, microwave, electric cooker, cutlery, dishes, plates, glasses, cups, toaster, kettle. Notes on accommodation: The best location in the city, close to all important places. WIFI is available in the apartment. Studio apartment on 2nd floor with balcony. The price includes all costs (electricity, etc). Bed linen and towels are included. The apartment is fully cleaned before arrival. Other: Lot of guides, maps, programmed magazines are available. 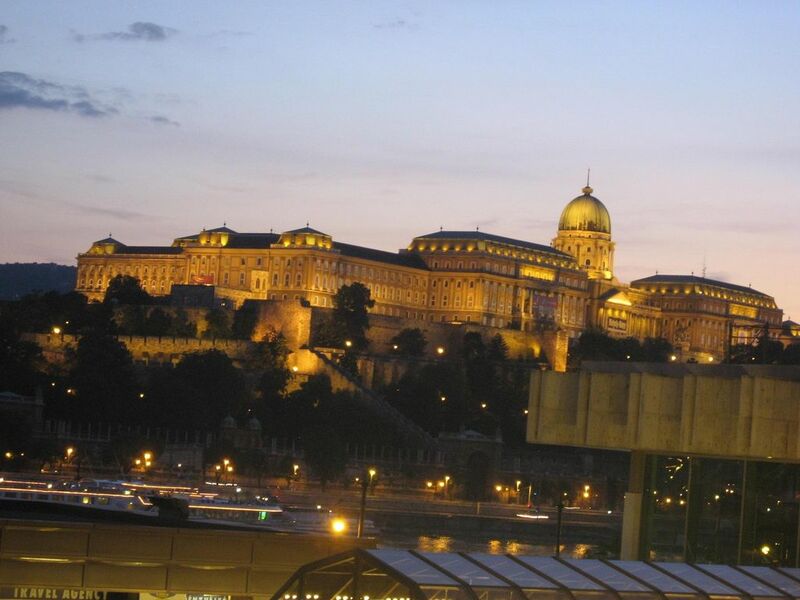 The apartment was comfy and had great views of the the fortress and palace on the Buda side. It's a perfect location; centrally located to a lot of must-see sites and districts. Hedi was a great host and met us at the flat to hand over the keys and go over everything at the apartment. The hot water was great, and the bed was comfy. The bed is 2 small beds pushed together, but my husband and I didn't mind. We had enough room and were warm enough. We didn't spent much time at the apartment, but when we did, it was a nice place to put our feet up and listen to traditional gypsy music. The microwave and fridge were nice to have, and the kitchen had glasswear and everything you'd need. The apartment was stocked with enough paper towels and toilet paper too. There's also a corner market right below the flat, which was very handy for buying a bottle of wine to enjoy in the evening. There's a good bakery a couple doors down, across from the Marriott. Plus, being right by the Marriott offered easy access to a taxi to go to the airport. We would totally rec this to any single or couple visiting Budapest, and we would stay here again. Thank you for your review, we are happy that you enjoyed your staying at our apartment in Budapest. Welcome you any time. it was lovely- looking out over the Danube-- perfect location, nicely decorated.. perfect!! Great location and very helpful hosts! Great location near plenty of restaurants and major tourist attractions. Also a very safe neighborhood with plenty of cabs nearby! The hosts made themselves readily available if we had any questions, and even went out of their way to warn us about upcoming road closures to make sure we didn’t miss our flight. There’s also coffee and tea provided in the apartment. It is in a perfect spot and so very convenient with a grocery store a couple of doors away and, yes, it even has a very large McDonalds which is very handy if you want to grab something quickly after a tiring day visiting all the wonderful sights which are everywhere. Would return again at anytime possible. The owners were very helpful and always available. It was great. Thank you for all your kind efforts. Thank your for your review and we are happy that you enjoyed your staying at our place. Welcome you any time. Best possible location . Could walk to nearly everything . Boats , trams , restaurants , most sights all so close . Rudas baths across the bridge . Great view from the balcony . Better than any hotel . Heidi and Robert were great hosts . Thank your for your review and we are happy that you enjoyed your staying at our place. In Budapest for a conference. The walk to the Vigádo center was 5 minutes. Bakery and small market within same block. Located right on promenade. Weather was very hot - NO A/C in studio. Ceiling fan & floor fan. Not able to leave windows open at night due to traffic noise. Other than weather being hot and humid, Hedi and Robert are gracious hosts and cater to one’s needs. Would stay there again!! The apartment is situated in the heart of the downtown - Apaczai Csere Janos Street - at the beginning of vibrant Danube promenade and within walking distance of most popular tourist attractions. Majority of the big hotels are also located in these area: Marriott, InterContinental, Sofitel, Four Season, Kempinsky. Booking Notes: Please contact owner for booking details.